Similar to the classic Underwood. The piezo elements are covered with leather. 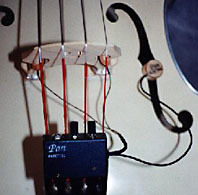 It is a simple microphone attached to the surface of the belly and matches with the same maker’s piezo-PU. Both signals can be mixed in the preamp.